The Fall of Berlin (1950). In the film division of the University of Wisconsin—Madison, we’ve developed a reputation for revisionism. We like to probe received stories and traditional assumptions. 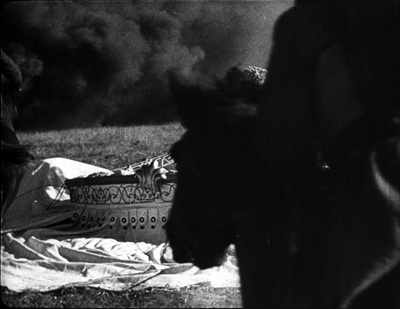 In Soviet film studies, Vance Kepley’s In the Service of the State challenged the idealized portrait of Alexandr Dovzhenko, pastoral poet of Ukrainian film, by tracing his debts to official ideology. In my book on Eisenstein, I suggested that this prototypical Constructivist opens up a side of modernism that is artistically eclectic, and even conservative in its gleeful appropriation of old traditions. Now we have a new book telling a fresh story. 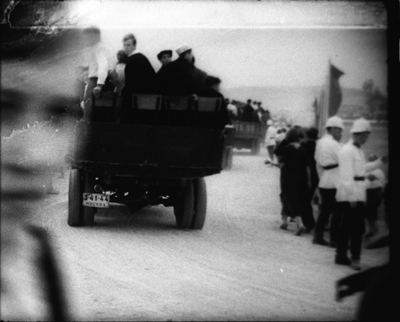 Maria (“Masha”) Belodubrovskaya’s Not According to Plan: Filmmaking under Stalin draws upon vast archival material to argue that filmmaking, far from being an iron machine reliably pumping out propaganda, was decentralized, poorly organized, weakly managed, driven by confusing commands and clashing agendas. Censorship was largely left up to the industry, not Party bureaucrats, and directors and screenwriters enjoyed remarkable flexibility. Was this an ideological juggernaut? Aiming at a hundred features a year, the studios were lucky to release half that. In 1936 95 films were planned, but only 53 were produced and 34 made it to screens. From 1942 on, those millions of spectators saw only a couple of dozen annually. The nadir was 1951, with 9 releases. (Hollywood studios released over 300.) The flood of propaganda was more like a trickle. Theatres were forced to run old Tarzan movies. When quantity became thin, apologists claimed that quality was the true goal. 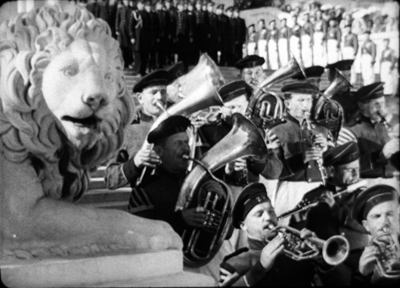 But Ninotchka’s hope for “fewer but better Russians” wasn’t realized in the film domain. Critics and insiders admitted that nearly all the films that struggled into release were mediocre or worse. 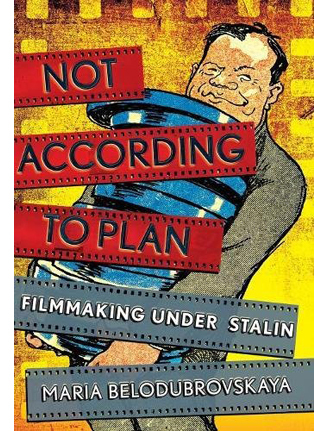 Not According to Plan shows that Soviet institutions were incapable, by their size, organization, and political commitments, of organizing a mass production film industry. Efforts to set up something like the U.S. studio system ran up against obstacles: there weren’t enough skilled workers, and decision-makers clung to the notion of the master director. Boris Shumyatsky, who visited Hollywood and tried to create something similar at home, got his reward at the muzzles of a firing squad. But brute force like this was rare; there were few administrators and creators to spare. The great plan was to have a Plan—specifically, a thematic one. Production would be based on an annual cluster of powerful topics like “Communism vs. capitalism” and “Socialist upbringing of the young.” Personnel were slow to realize that themes were not stories, let alone gripping ones, and the real work of imagination remained un-plannable. Starting from themes rather than plot situations, the overseers could judge only final results, which meant enormous investments in development and production—all of which might never yield a politically correct movie. The filmmaking community, and specifically film directors, never gave up on the standard of artistic mastery. They listened to the signals sent by the Soviet leadership, but then incorporated these into their own professional value system, which developed in the 1920s outside the purview of the state. Using the state’s discourse of quality and their peer institutions, they enforced their own shared norms of artistic merit. The downside of this system, plan or no plan, was that when the film didn’t pass muster, the director was to blame. Yet the twenty or so “master” directors could survive failed projects. New talent wasn’t trusted; there were too few directors; and most basically, the organization of production remained artisanal. The role of the producer (let alone the powerful producer) scarcely existed. 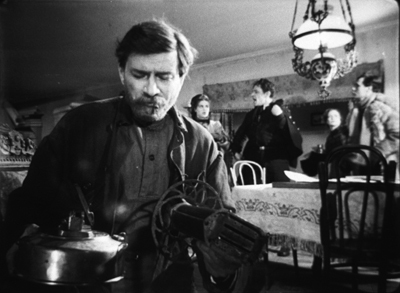 To a surprising extent, Soviet cinema encouraged the director as auteur. How’s that for revisionism? Screenwriters weren’t as powerful, but they did their part. Masha has a fascinating chapter on the changing conceptions of the Soviet screenplay. The “iron scenario,” modeled on a Hollywood shooting script, was intended to lay out the film in toto, so directors couldn’t overshoot or make changes. This initiative, predictably, failed. There followed other variants: the butter scenario, the margerine scenario, and the rubber scenario (no kidding), then the emotional scenario and the literary scenario. Masha traces the work process of screenwriting and the mostly futile efforts of literary figures to leave their stamp on a production. A similar stress on process characterizes her occasionally hilarious case studies of censorship. Some of these expose the limits of industry self-censorship. 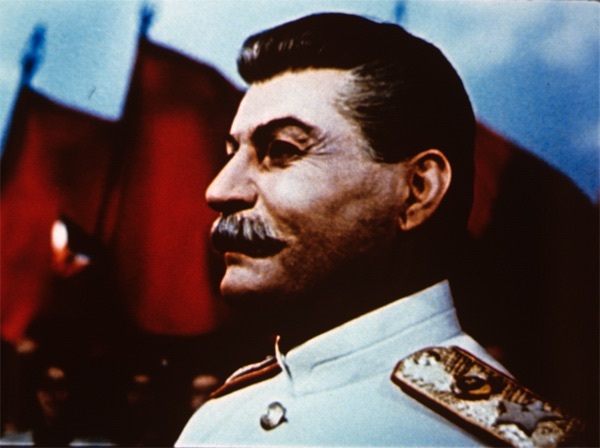 One agency signs off on a film, the next one castigates it, the next one reverses that judgment, Pravda weighs in, and finally Stalin speaks up—with a completely unpredictable verdict, à la Trump. 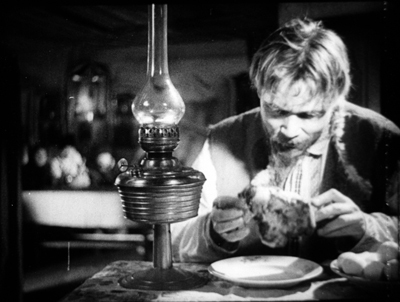 The tale of Medvedkin’s The Miracle Worker, which jumped through all the hoops and wound up being banned after initial screenings anyhow, might have been written by Zoshchenko or Ilf and Petrov. Among the elements judged “absolutely impermissible” were shots of cows reading newspapers. 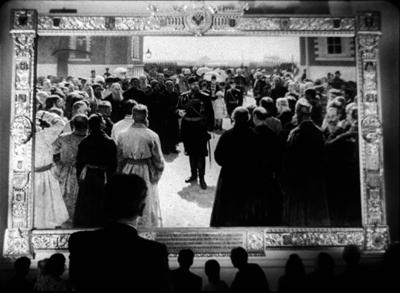 The artistic and popular success of Soviet films during the New Economic Policy (1921-1928) had spurred hopes for a mass-market sound cinema that was also of high quality. What crushed that dream? Masha gives us the hows (the machinations of the studios and government bodies) and the whys (the underlying causes and rationales). Not According to Plan is a trailblazing study of what she calls “the institutional study of ideology.” It’s also a quietly witty account of the failures of managed culture. How could artists be engineers of human souls if they couldn’t engineer a movie? But go back to the quality issue. What were those Stalinist films like artistically? Three projects I’ve undertaken led me to Stalin-era cinema. Nearly all English-language film histories ignored it, or reduced it to boy-loves-tractor musicals. So Kristin and I wanted our textbook Film History: An Introduction to consider it. (Revisionism again.) My Cinema of Eisenstein and On the History of Film Style built on what I saw at archives in Brussels, Munich, and Washington DC. 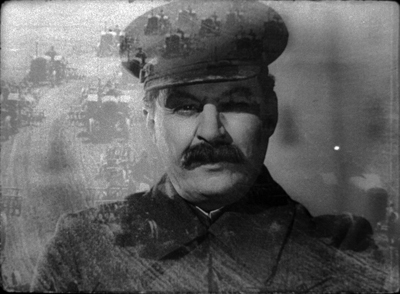 As a result I sought to mount an argument that Stalinist cinema was worth our attention, especially from the standpoint of film technique. The run-of-the-mill productions seemed fairly shambolic, but the top-tier dramas revealed an academic style that interested me. Some films recalled, even anticipated, innovations taking hold in Europe and America, but other creative choices were surprisingly offbeat, and not what we associate with standard propaganda. 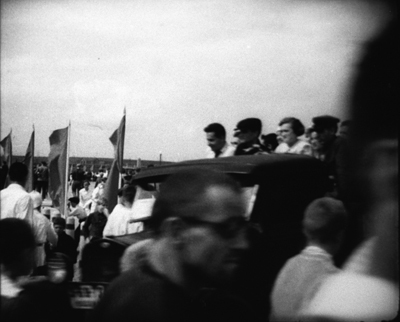 For one thing, it was clear that montage experiments didn’t end with the 1920s, the arrival of sound, or even the “official” establishment of Socialist Realism around 1934. 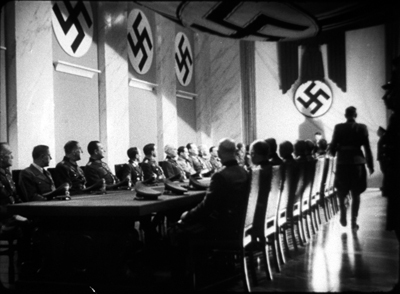 Granted, classic continuity editing rules the fiction films of the 1930s and 1940s, and the most flagrant extremes of the montage style were purged. But some moments recall the silent era. These passages are typically motivated, as in Hollywood and other national traditions, by rapid action. 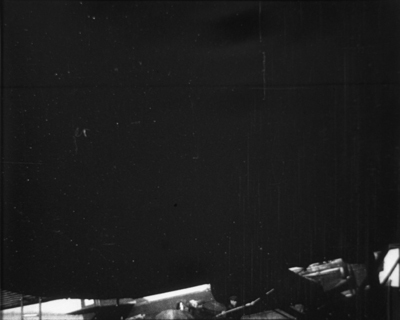 Military combat calls forth stretches of 2-4 frame shots of bombardment in The Young Guard, Part 2 (1948). 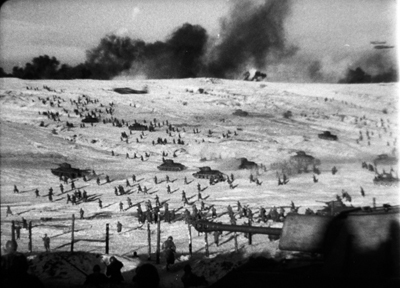 The combat scenes of The Battle of Stalingrad (1949) include very brief shots. In one passage, an artillery blast consists of three frames—one positive, a second negative, and a third positive again, creating a visual burst. 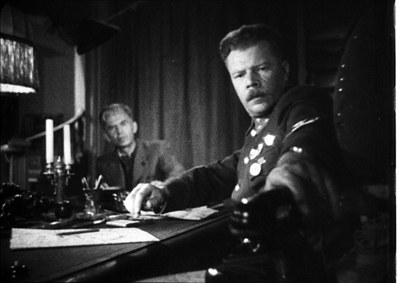 The abrupt disjunctions of the 1920s style can be felt a little in one cut of The Fall of Berlin (1950), when at the end of a long reverse tracking shot, Alyosha and his comrades rush the camera. Cut to Hitler recoiling, as if he sees them. As you’d expect in an academic tradition, the use of fast cutting for fast action isn’t disruptive. 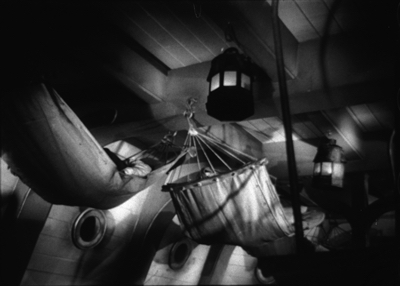 A little more unusual is the embrace of wide-angle lenses, often more distorting than in Western cinema. 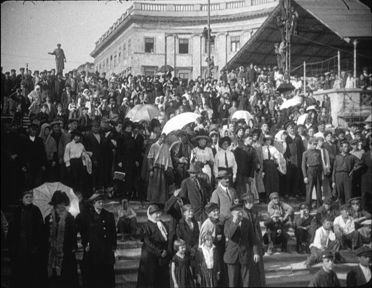 Wide-angle imagery was used by 1920s filmmakers, often to caricature class enemies or to heroicize workers. 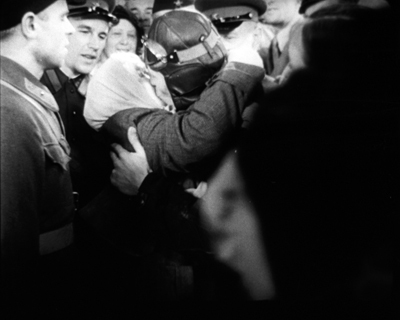 The same sort of thing can be seen in Kutuzov (1945), when a soldier is presented in a looming close-up, or in Front (1943), when a gigantic hand reaches out for a telephone. This use of wide angles to give figures massive bulk continued through the 1950s, as in The Cranes Are Flying (1957). 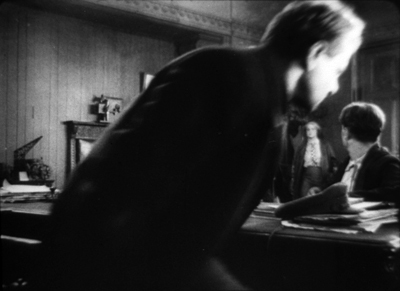 The 1940s aggressive wide-angle shots run parallel to Hollywood work, when in the wake of Citizen Kane (1941), The Little Foxes (1941), and other films, many directors and cinematographers created vivid compositions in depth. Those weren’t unprecedented in America, as I try to show in the style book, but there were some early adopters in Russia as well. 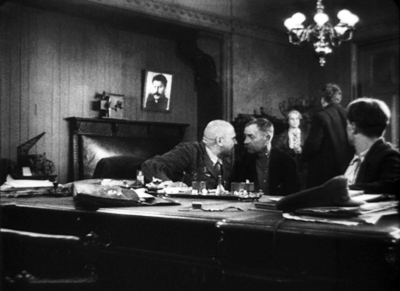 Obliged to show meetings of saboteurs, workers, generals, and party leaders, Soviet filmmakers had to dramatize people in rooms, talking at very great length. The result was a tendency toward depth staging and fairly long takes. The low-angle depth shot stretching through vast spaces became a hallmark of this academic style in the 1930s and after. 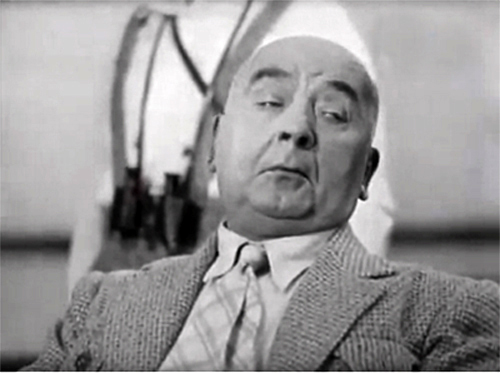 Director Fridrikh Ermler, one of the few directors who was a Party member, claimed that he devised a “conversational cinema” to deal with the prolix dialogue scenes in The Great Citizen (1937, 1939). The movie teems with shots that wouldn’t look out of place in American cinema of the 1940s. As a solution to the problem of talky scenes, staging of this sort makes sense as a way to achieve some visual variety, and to show off production values. By the 1940s, such flamboyant depth became even more exaggerated. 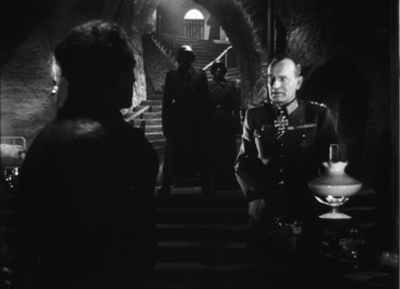 We see it in the telephone framing from Front above, as well as in The Young Guard Part 1 (1948, below left) and the noirish stretches of The Vow (1946, below right). 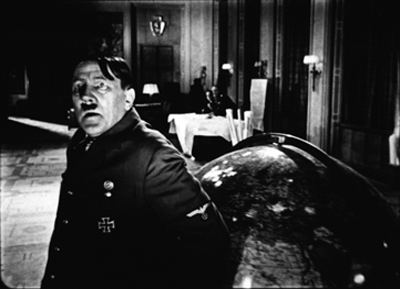 The Fall of Berlin can use depth to contrast the placid self-assurance of Stalin with a ranting Hitler, bowled over by his globe. 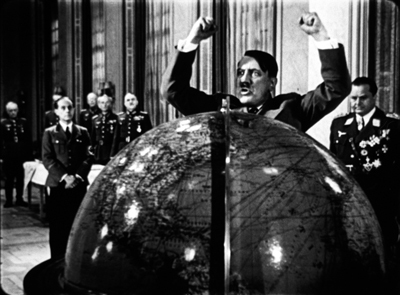 Is this a reference to the globe ballet in The Great Dictator? It’s well-known that for Kane Orson Welles and Gregg Toland wanted to maintain focus in all planes, sometimes resorting to special-effects shots to do so. The Soviets valued fixed focus as well, as several shots above suggest. It could be maintained if the foreground plane wasn’t too close, and the depth of field would control focus in the distance. Hence many shots use distant depth. At one point in The Great Citizen, when a woman interrupts a meeting, the official in the foreground trots all the way to the rear to meet her. The sense of cavernous distance is amplified by the wide-angle lens. But sometimes pinpoint focus in all planes wasn’t the goal. Another way to activate depth was to rack focus. 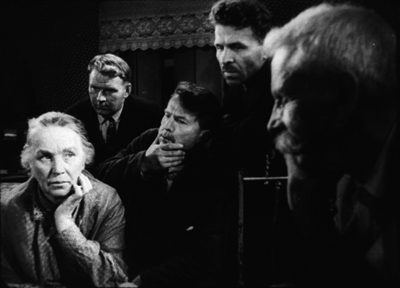 In this scene of Rainbow (1944), the man who has betrayed the village comes home and discovers a delegation waiting to try him. At first they’re out of focus, but when he turns they become visible. Focused or not, some of these shots push important action to the edge of visibility in a way that would be rare in American cinema. 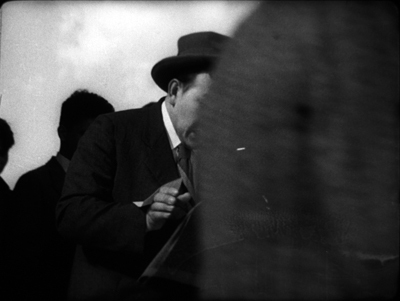 In A Great Life, a snooper is centered but sliced off by a window frame and kept out of focus, while a trial scene is interrupted by a figure far in the distance who bursts in to announce a mine collapse. 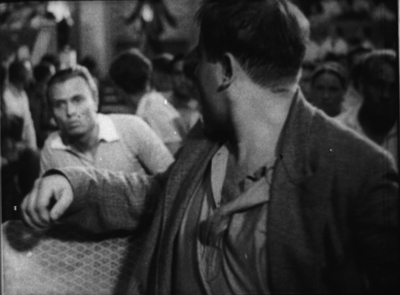 The Great Citizen shows Shakhov discussing a suspect, who hovers barely discernible in the background over his left shoulder. I enlarge the fellow and brighten the image. 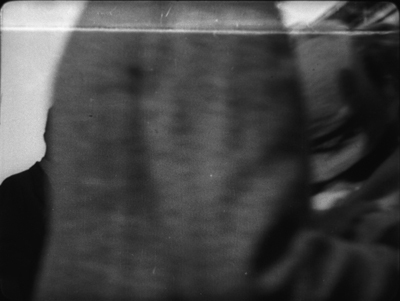 This makes Wyler’s sleeve-shot in The Little Foxes seem a little obvious. 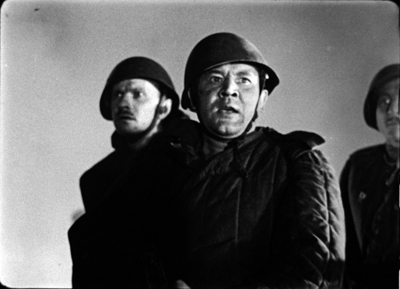 If American movies favor titles called The Big …., the Soviets liked The Great …. (Velikiy). But The Big Sleep doesn’t look all that big, and The Big Sick is big only to a few people, and The Big Knife doesn’t even have a knife. In the USSR, calling something big summoned up monumentality. Stalinist culture was grandiose in its architecture, sculpture, painting, literature, and even music, with symphonies of Mahlerian length and oratorios boasting hundreds of voices. Accordingly, one effect of the depth aesthetic was to grant the characters and their settings a looming grandeur. Earth-changing historical events were being played out on a vast stage that framing and set design put before us. Naturally, battles are on a colossal scale. 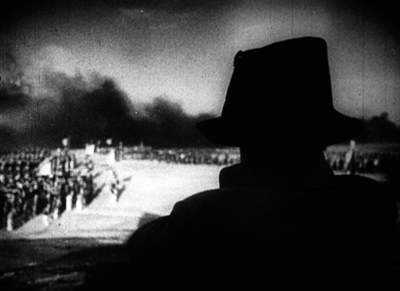 Napoleon broods in the foreground (Kutuzov) and troops march endlessly to the horizon (The Vow). 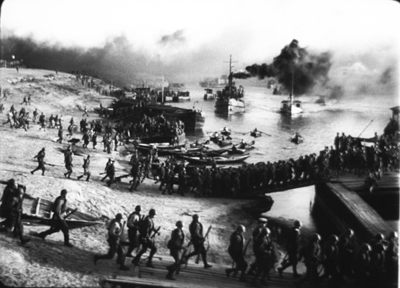 1940s films feature wartime landscapes on a scale almost unknown to Hollywood. If God favors the biggest battalions, God would seem to love the Russians (a prospect that otherwise seems invalidated by history). 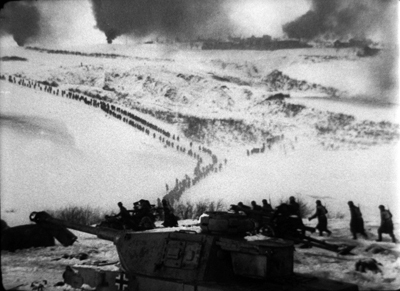 Below: The Battle of Stalingrad. 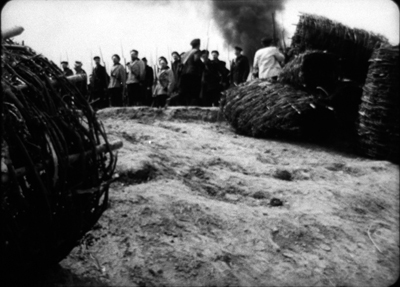 These landscapes are surveyed in long tracking shots, a habit that survived in Bondarchuk’s War and Peace (1966-1967). Soviet forces command impressive headquarters (The Great Change, 1945), perhaps necessary to balance the Nazis’ resources (The Vow). Parlors and committee rooms are remarkably big, and even prison cells (The Young Guard Part 2) and farmhouses (The Vow) have plenty of room. 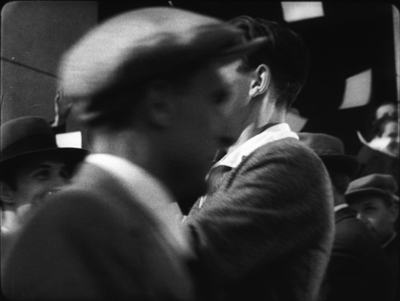 Gigantism wasn’t unknown in 1920s cinema, or in Russian painting both classic and recent. The Vow seems to justify its scale by reference to a Repin painting, which the characters see on display. 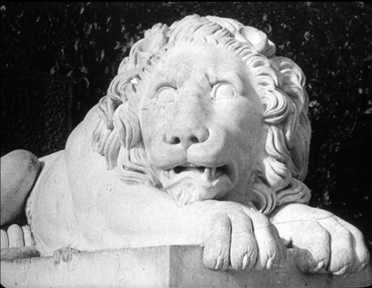 Not only were the 1920s silent classics monumental; they became monuments. 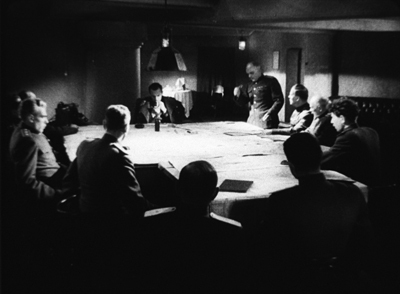 Masha records the veneration that the “master” directors felt for the works of Eisenstein, Pudovkin, Kuleshov, Barnet, and other predecessors. 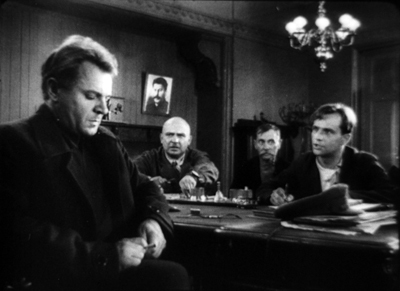 Moments in the Stalinist cinema seem to refer back to that era. 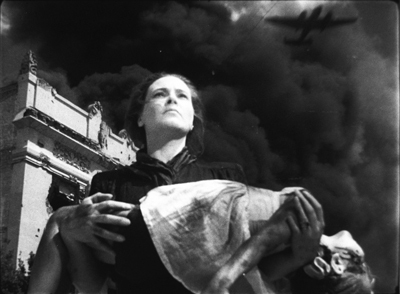 The Battle of Stalingrad evokes the mother with the slain child on the Odessa Steps, and The Vow has the nerve to superimpose on Stalin (friend of farmers) an image of concentric plowing from Old and New. These can be taken as cynical ripoffs, but in a way they testify to the fact that great silent films had forged some enduring iconography. 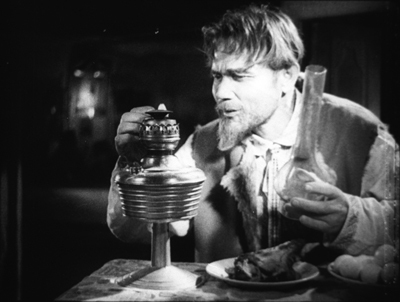 You don’t hear much about Pudovkin’s 1930s and 1940s films, but they can be exuberantly strange. 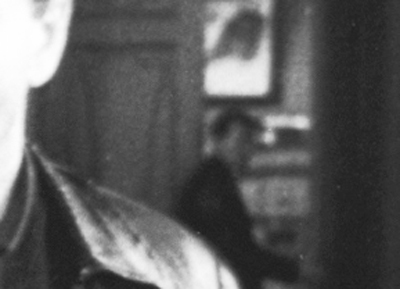 Eisenstein aside, he stands in my viewing as the director who played around most ambitiously with the academic style. 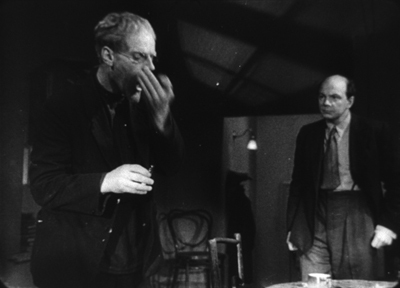 Perhaps he was encouraged in this by his young codirector Mikhail Doller, but Pudovkin had already tried out some audacious strokes in A Simple Case (1932) and Deserter (1933). For a high Stalinist example take Minin and Pozharsky (1939). This tale of seventeenth-century warfare seems virtually a reply to Alexander Nevsky (1938), as Mother (1926) responded to Strike (1925). 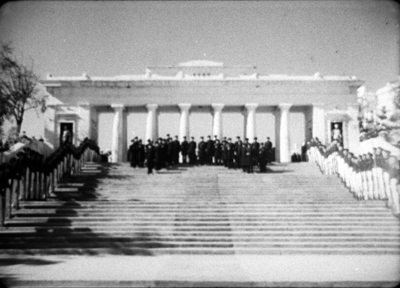 Minin opens with statuesque staging reminiscent of Eisenstein’s film, but the scene is handled in telephoto shots and to-camera address. 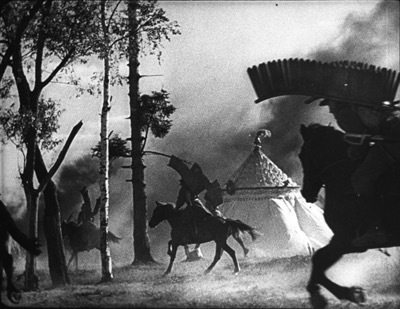 The combat scenes employ handheld battle shots, along with close-ups of fighters and horsemen that aren’t stylized in the Nevsky manner. But there’s more than pastiche here. One battle shows the Russian forces rushing from the left in tight tracking shots, while the enemy forces move from the right in panning telephoto. Especially striking are axial cuts, beloved of Soviet filmmakers for static arrays, employed in movement. 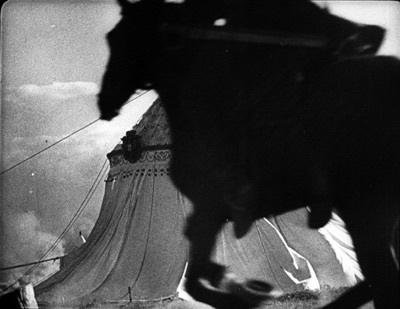 Horses sweep past a tent in extreme long-shot; they smash into the tent in long shot; and in a closer view the tent lies trampled as other horses continue to flash through the foreground. The shots are 50 frames, 38 frames, and 13 frames respectively. For a moment, we might be back in the great era of Soviet editing. 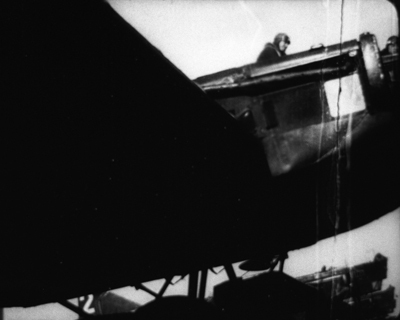 Victory from 1938 is a drama in which aviators set out to rescue an interrupted around-the-world flight. 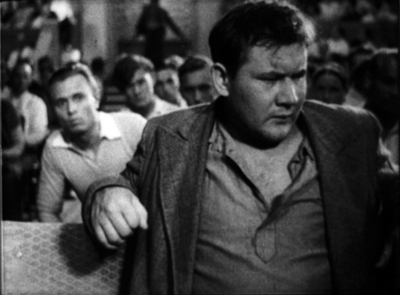 Here Pudovkin and Doller invoke the depth staging of the era only to disrupt it with what we might call “smear” cuts. During the parade for the departing airmen, for instance, a young man happily tossing papers, in another grotesque wide-angle shot. He’s blocked by a man passing through the frame. Match on action cut to another figure, close to the camera and moving in the same direction. This figure wipes away to reveal a man reading a newspaper. This sort of weird graphic match becomes a stylistic motif in the film. 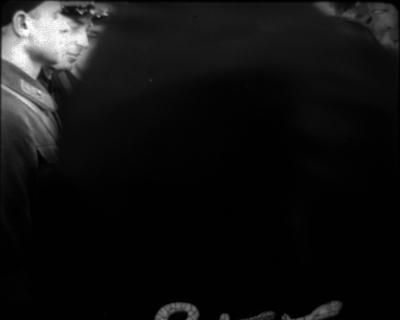 Later, when the rescue has been completed, another crowd scene yields a similar pattern of depth smeared and exposed. 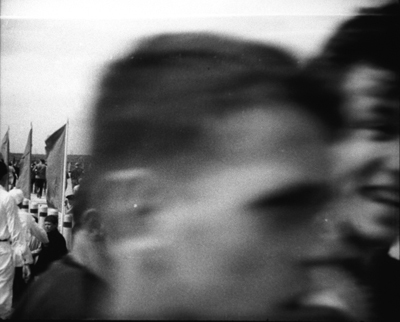 A shot of the parade is sheared off by a woman’s passing face. That cuts to a man’s passing face, which moves away to show the crowd behind him. The patterning pays off when the victorious plane rolls triumphantly through the frame, blotting out the image, to be graphically matched by a passing figure who unveils the pilot’s mother embracing him. 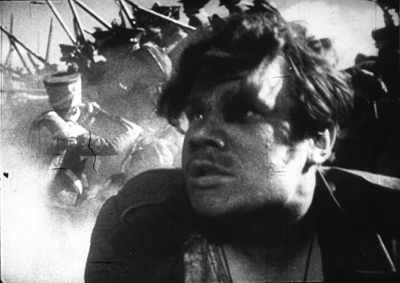 In Admiral Nakhimov (1947) Pudovkin and Doller employ the smear-cutting technique during a battle scene. Stills are totally unable to capture the way this looks. 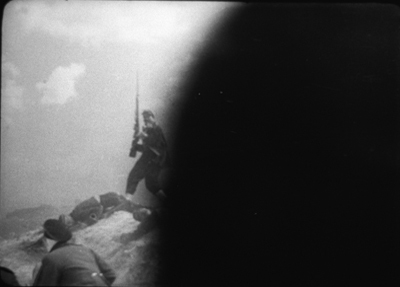 Soldiers charge up a hill, and their falling bodies, briefly blocking the camera’s view, are given in jump-cut repetitions that suggest, through a spasmodic rhythm, the sheer difficulty of advancing. Even stranger is the moment when soldiers rush toward a distant fortification, with a latticework basket in the foreground. Cut to the hill edge, with a comparable blob moving leftward through the frame. It turns out to be a fighter’s shoulder. The oddest part is that this second shot is only six frames long, and every frame after the first is a jump cut; that is, some frames have been dropped as the blob makes its way across the image. 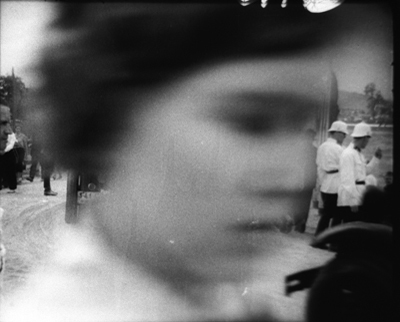 The effect on your eye is percussive, and seems to be anticipated by Pudovkin’s experiments in popping black frames into shots in A Simple Case. What kind of director thinks like this? Of course these Pudovkin/Doller films also subscribe to the official look, with monumental depth staging. 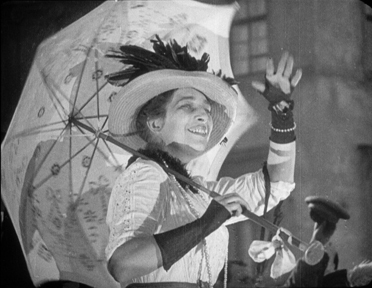 The films acknowledge the 1920s tradition as well. 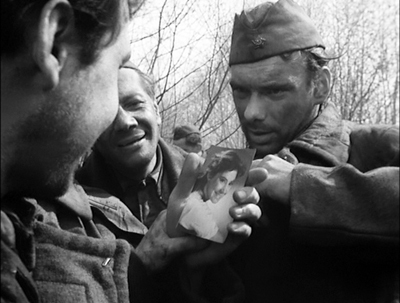 Admiral Nakhimov casts a personal look back to Pudovkin’s great rival. 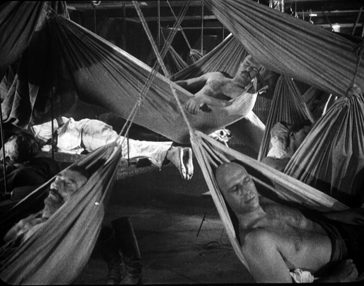 A shot of the crew’s tautly bulging hammocks recalls, maybe cites, the crew’s sleeping area of Potemkin. In Odessa, Admiral Nakhimov echoes Potemkin even more strongly. We get waving crowds, the stone lions, and a reminder of those famous steps. 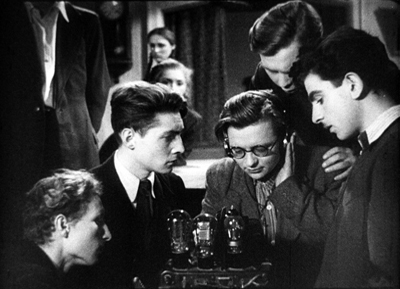 In sum, the Stalinist cinema holds a unique interest for students of the history of film style. Not only did it apparently constitute a significant development in technique, but in forming a tradition, it provided a counterpart and sometimes a counterpoint to developments in the West. 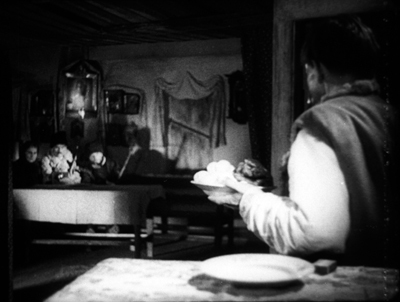 Later that tradition became something for directors to react against (Tarkovsky and Sokurov come to mind) or to adapt to new purposes (I’d put Jancsó in that category). For all the behind-the-scenes bungling, it became much more than a propaganda vehicle. Scholars who study Stalinist film are usually impelled by an interest in propaganda or an interest in the audience’s response. My questions were different. I was driven by my interest in Eisenstein and comparative stylistics. 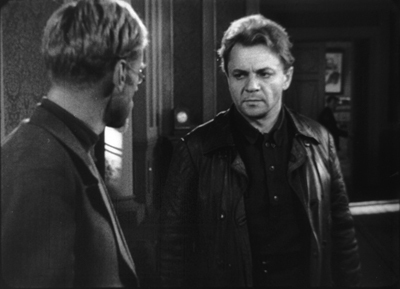 So I tried to investigate the formal and stylistic norms of Soviet cinema. Some of those norms Eisenstein helped create, and then revised for his own ends. Still, I feel like a butterfly collector picking out vivid specimens for an expert to explain. I can’t supply the hows and whys. How did filmmakers manage to create these remarkable images? What technical resources, of lenses and lighting rigs and film stock and set design, permitted them to craft these striking shots? Were their peers and masters insensitive to this official look? Was it taken for granted? Or was it self-consciously promoted and taught? 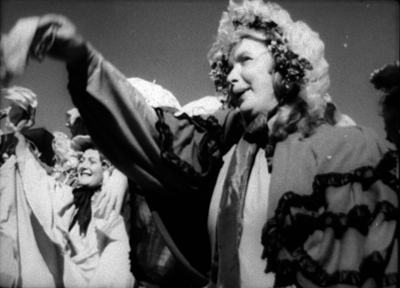 Some of these schemas are developed in Eisenstein’s lectures at the Soviet film school. And how, at a more micro-level, do these patterns function in the individual films? As for the whys: Why did filmmakers embrace these options rather than others? And why did they develop, sometimes apparently in a spirit of play, some oddball technical innovations? Such questions seem to me compelled by films that turn out to be more artistically interesting than most commentators have noted. One of the most corrupt and brutal political systems in world history produced films of considerable interest, and a few of enduring value. I hope experts try to figure this all out. I bet Masha Belodubrovskaya will lead the way. Her new book is a splendid start. Masha is no stranger to this blog, having translated Viktor Shklovsky’s remarkable “Monument to a Scientific Error” for us. This is a good place to thank all the people who helped me see Stalinist films in archives over the decades. That number includes Gabrielle Claes, Nicola Mazzanti, and the late Jacques Ledoux of the Belgian Cinematek; Enno Patalas, Klaus Volkmer, and Stefan Droessler of the Munich Film Museum; and Pat Loughney, then of the Library of Congress. I learned of Ermler’s “conversational cinema” (razgovornyi kinematograf) from Julie A. Cassiday’s “Kirov and Death in The Great Citizen: The Fatal Consequences of Linguistic Mediation,” Slavic Review 64, 4 (Winter 2005), 801-804. 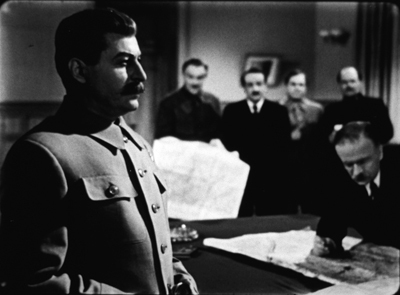 The depth aesthetic of high Stalinist cinema proved valuable when 1960s bureaucrats decided to make Stalin disappear. 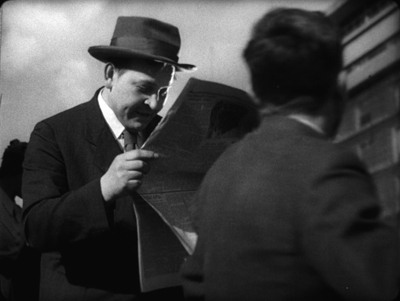 See our online supplement to Film History: An Introduction. 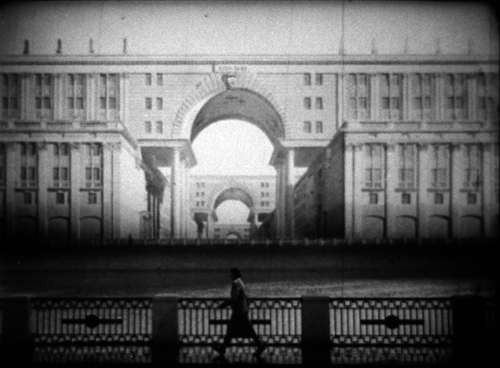 There are more examples of “Stalinist formalism” in On the History of Film Style–recently declared out of print, but soon to appear in a new electronic edition on this site. See also my Cinema of Eisenstein for arguments about how he created and then swerved from some of his peers’ norms. Today’s Google Doodle pays tribute to Eisenstein on his birthday. But they make him a slim, hip metrosexual. Revisionism can go too far. 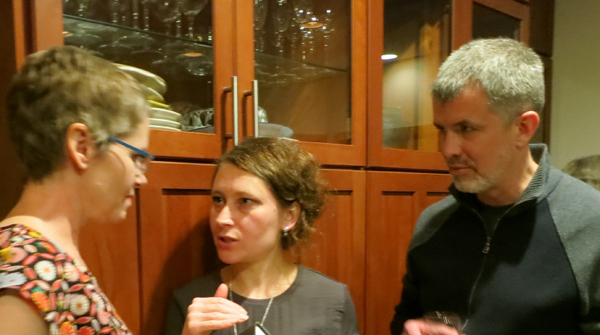 Kelley Conway, Masha, and Scott Gehlbach, at a party last night celebrating Masha’s book–and her winning tenure! Kelley’s contributions to our blog are here and here and here. 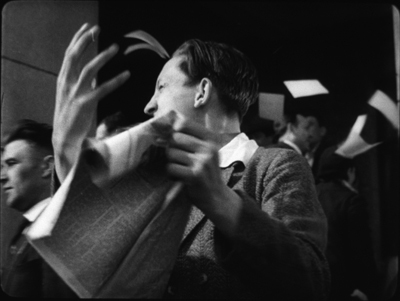 This entry was posted on Monday | January 22, 2018 at 9:27 am	and is filed under Books, Directors: Eisenstein, Directors: Pudovkin, Film history, Film technique: Editing, Film technique: Staging, National cinemas: Russia and USSR, UW Film Studies. Both comments and pings are currently closed.